''Besides the regular confederacies, with their moderate degree of subordination, there was a body of men who threw off all subjection to earthly governors, and who peculiarly represented the religious element of Sikhism. These were the " Akalees," the immortals, or rather the soldiers of God, who, with their blue dress and bracelets of steel, claimed for themselves a direct institution by Govind Singh. 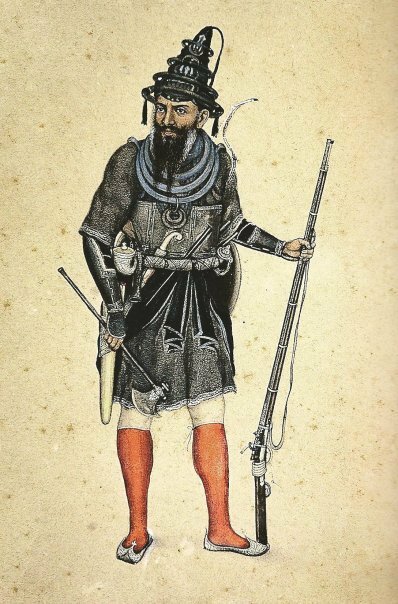 The Gooroo had called upon men to sacrifice every thing for their faith, to leave their homes and to follow the profession of arms; but he and all his predecessors had likewise denounced the inert asceticism of the Hindoo sects, and thus the fanatical feeling of a Sikh took a destructive turn. The Akalees formed themselves in their struggle to reconcile warlike activity with the relinquishment of the world. The meek and humble were satisfied with the assiduous performance of menial offices in temples, but the fierce enthusiasm of others prompted them to act from time to time as the armed guardians of Amritsir, or suddenly to go where blind impulse might lead them, and to win their daily bread, even single-handed, at the point of the sword. * They also took upon themselves something of the authority of censors, and, although no leader appears to have fallen by their hands for defection to the Khalsa, they inspired awe as well as respect, and would sometimes plunder those who had offended them or had injured the commonwealth. The passions of the Akalees had full play until Runjeet Singh became supreme, and it cost that able and resolute chief much time and trouble, at once to suppress them, and to preserve his own reputation with the people''. - J. D. Cunningham, 1849. Khalsa - Qazi Nur Mohammed, a Muslim cleric in the service of Ahmad Shah Abdali, the Emperor of Afghanistan who invaded India numerous times in the mid 1700's. “When I recall that day, I tremble with the fear of the Doomsday.” “Do not call the dogs (the Sikhs) dogs, because they are lions (and) are courageous like lions in the battlefield. How can a hero, who roars like a lion be called a dog? (Moreover) like lions they spread terror in the field of battle. If you wish to learn the art of war, come face to face with them in the battlefield. They will demonstrate it (art of war) to you in such a way that one and all will shower praise on them. If you wish to learn the science of war, O swordsman, learn from them. They advance at the enemy boldly and come back safely after action. Understand, Singh is their title, a form of address for them. It is not justice to call them dogs; if you do not know Hindustani language, then understand that the word ‘Singh’ means a lion.”Truly, they are lion in battle, and at times of peace, they surpass “Hatim” (in generosity ). When they take the Indian sword in their hands they traverse the country from Hind to Sind. None can stand against them in battle, howsoever strong he may be. When they handle the spear, they shatter the ranks of the enemy. When they raise the heads of their spears towa-rds the sky, they would pierce even through the Caucasus (in the process). When they adjust the strings of the bows, place in them the enemy killing arrows (and) pull the strings to their ears, the body of the enemy begins to shiver with fear. When their battle axes fall upon the armour of their opponents, their armour becomes their coffin. - Qazi Nur Mohammed, a Muslim cleric in the service of Ahmad Shah Abdali, the Emperor of Afghanistan who invaded India numerous times in the mid 1700's. 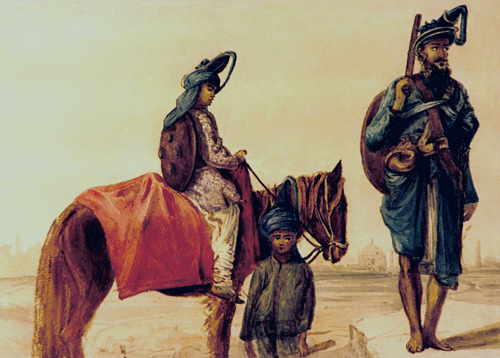 Akalis - Victor Jacquemont, French traveling historian and naturalist to the Royal Museum of Natural History of Paris, who spent three years in Punjab between 1829-1832.
" The Akalis, or Immortals, are properly speaking Sikh faqirs. Their rule compels them to be dressed in blue and always to carry arms. The sacred pool at Amritsar is their headquarters, but they often spread themselves over the Punjab in large and formidable parties. Ranjit (Maharaja Ranjit Singh), wisely turns their ferocity to his own advantage. He enlists them in his armies, and employs them, preferably against his Mussalman enemies. He has at the moment about 4,000-5,000 of them in the army which he maintains at Attock, ready to march against another fanatic, the Syed. I have only seen two of them in the streets of Amritsar, it was evening and their arms glittered in the light of the torches and the matches of their muskets hung ready lighted. I had never seen more sinister-looking figures. After Amritsar their favorite headquarters is Lahore. One sees them chiefly on the outskirts of the city among the ruins of the Mughal palaces and mosques. This is their lair. Nearly all of them are mounted on ponies and armed with a spear or matchlock, others have only a bow or a sword. They are dressed in tattered blue clothes and most of them wear a long pointed head-dress of the same colour, surrounded at its base with a polished steel ring like a brim of a hat. They are hideous to behold. They live on what they can take if it is not given to them. Sometimes they collect in parties of hundred and mingle among the Rajah's attendants, and when they think themselves strong enough, they threaten him and demand money. They have more than once held him up to ransom, but Ranjit has never ventured to take vigorous measures and give a general order to put them in positions from which they have little chance of returning, and they usually come back in smaller numbers for they fight with desperate courage. " - Victor Jacquemont, French traveling historian and naturalist to the Royal Museum of Natural History of Paris, who spent three years in Punjab between 1829-1832. Taken from " Letters from India ", published in London 1834. “The Sycks are Deists in the strictest sense of the word, and of course, perfectly tolerant and harmless; although as soldiers, they are, like the Marhattas, merciless plunderers, and incessant skirmishers. The ceremony of the reception of a Proselyte consists in no more than these two articles: to put on a short dress, of a blue colour, from head to foot; and to let one’s hair grow from head to foot, without ever cutting or clipping or shaving it. One day I got within one of their temples, invited thereto by the tingling of the cymbals: on appearing within the door, an old venerable man bid me leave my slippers, as none could enter, but bare-footed. This admonition I obeyed, and went into a hall covered with carpets, at the northern part of which, there were several cushions covered with a yellow veil, under which, I was told lay Nanec-Shah’s book, who is their legislator. At the southern end of the hall, there were fifteen or twenty men all in blue, and with long beards, sitting, some armed and some not. At the eastern side, but very near to it, two old men with a small drum and a pair of cymbals, were singing some maxims of morality out of that Book, and this they did with a deal of enthusiasm and contortion. On getting within the hall, I saluted the company, which returned the salute, and returned it again when I came out”. - Mir Ghulam Hussain Khan “The Review of Modern Times” 1763, Translated by M. Raymond 1789. 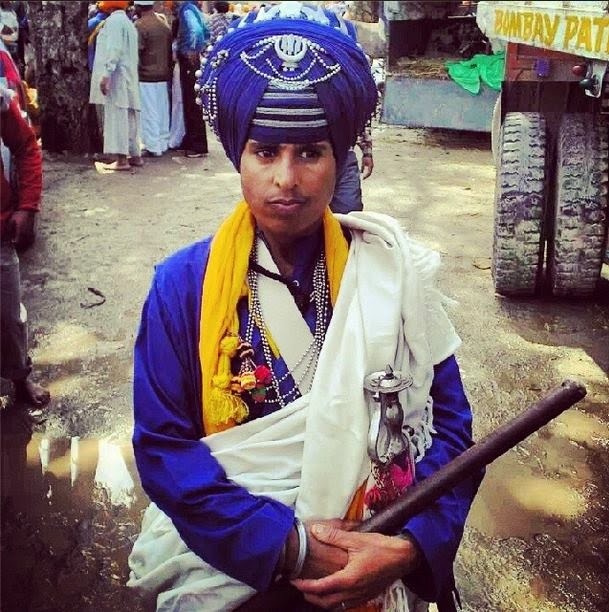 Vahiguru ji ka Khalsa Vahiguru ji ki fateh! I was listening to the katha of Baba Santa Singh ji of Prachin Panth Prakash, and decided to try and make it clearer by digitally remastering it. I think it is a lot clearer and louder now. As I listen to them I will post them up with the relevant chapters from the epic work by Bhai Rattan Singh Shahid: http://www.scribd.com/doc/61685716/Sri-Gur-Panth-Prakash-Rattan-Singh-Bhangoo-English see from pages 18 to 26. Unfortunately pp.11 - 17 are missing which tell how the British asked Rattan Singh to write his epic and mentions General Ochterlony, and Captain Murray. I have heard this was due to Baba Santa Singh ji telling the history of the Badal family and how they were British agents, and then joined the GOI. If anyone has tape number three please send it to me. The rulers have turned themselves into butchers. Dharma or Moral values have disappeared from public life. The truth, symbolised by Moon, has been eclipsed in this darkest phase. kali kātī râje kāsāī dharmu pankh kari uḍriā. kūṛu amāvas sachu chandramā dīsai nāhī kah chaṛiā. Guru Nanak Dev Ji, Rag Majh, AG, ang 145. Then Baba Santa Singh performs exegesis on the coming of Guru Nanak from the Sri Gur Panth Prakash of Bhai Rattan Singh Bhangu Shahid.